In my youth I was very fond of the colour orange. In fact, I can still remember the blouse that I just had to have when I was about 8 or 9 years old .... and the department store "discussion" with my mother as she tried to steer me towards something (anything) else! It was bright orange satin with a long rounded collar - quite something! Apparently my mother didn't forget either. A few years later I came home for the school holidays to find she had redecorated my room - with a bright orange feature wall facing my bed! After that, I was less enamoured of the colour! So here I am, trying to use orange! Well, to be accurate - Tangerine Tango. This was my finished card before added something else! This was another of my "build as you go" cards! I made a mask with one of the Eclectic Layers dies and wanted to test it out. I cut some flowers from Daffodil Delight off-cuts with another of the dies and coloured some Embossing Paste with a drop of Tangerine Tango ink refill. Once the paste was dry, I watercoloured Wild Wasabi onto the stems and some Peekaboo Peach onto the petals, concentrating the colour at the base. Then I waited a couple of days for inspiration to strike! 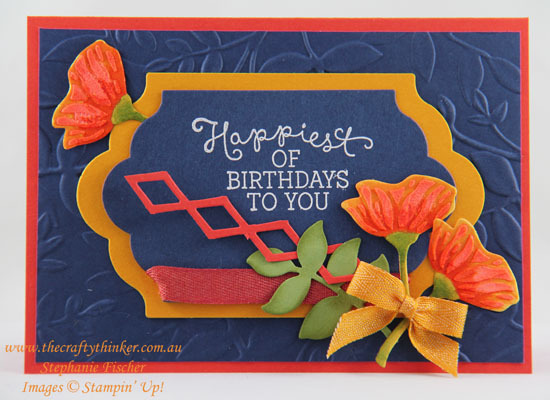 When it didn't, I cut a layer from Night of Navy cardstock and embossed it with the Layered Leaves 3D Dynamic embossing folder and added it to a Tangerine Tango card base. 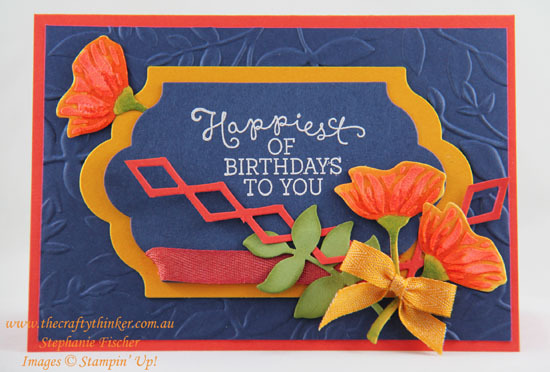 I used the Lots of Labels dies to cut some Crushed Curry and Night of Navy labels and White heat embossed a greeting from Birthday Blooms. I coloured some Whisper White Classic Weave ribbon with Tangerine Tango ink, cut some more elements with the Eclectic Layers dies and added a bow of Crushed Curry Mini Chevron ribbon. After taking the previous photo, I decided to try adding another piece of the diamond cut orange card. I couldn't decide whether I liked the card better with or without the extra little piece of orange decoration on the right side. What do you think? 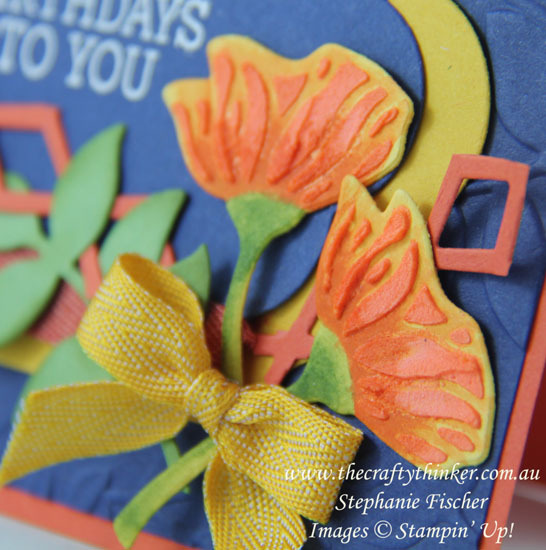 Close up of the flowers showing the dimension provided by the embossing paste. This card is entered into the Crazy Crafters' Project Highlights. Click here to see all the beautiful entries and vote for your favourites.